It's so hard to wake up on time. I set my alarm and I get out of bed, but I DRAG. Like, really, on our co-op days, I just DRAG...until I get a few cups of coffee in me, and it doesn't matter what time I go to bed either. I always seem to wake up tired. 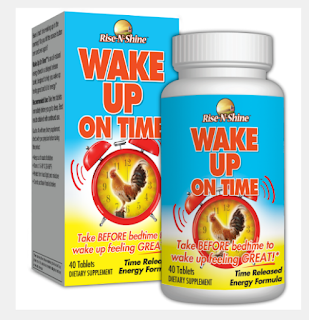 I was really excited to try this product called Wake Up on Time. It's time released, so you take it before bed, and when it's time to wake up, vitamins like B-12 and B-6 get released which helps you to have more energy. I am on day 3 of using these, and I am happy to say I feel so much better in the mornings! My alarm goes off, and it takes me a couple of minutes to feel like getting out of bed, but when I do, I definitely have more skip in my step. 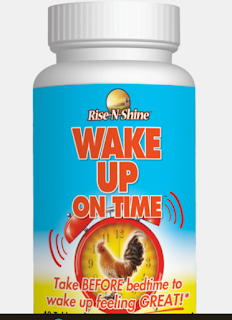 Rise-N-Shine's patented Wake Up On Time is the first product of its kind, taken BEFORE bed, but doesn't start working until it's time to wake up! Wake Up On Time will never prevent you from falling asleep - thanks to the magic of time release. Wake Up On Time contains the highest quality ingredients, including Vitamin B6, Vitamin B12, Guarana Seed Extract (100 mg caffeine), L-Tyrosine, Eleuthero Root extract and more! Wake Up On Time is designed to help you wake up in the morning feeling great and full of energy.